Rather than accumulate a library of Photoshop Elements books as help resources, you can look within Elements 9 to find valuable help information quickly and easily. If you’re stuck on understanding a feature, ample help documents are only a mouse click away and can help you overcome some frustrating moments. Photoshop Elements Help: Choose Help→Photoshop Elements Help or press the F1 key (Windows) or the Help key (Macintosh) to open the Elements Help file. You can type a search topic and press Enter to open a list of items that provide helpful information about the searched words. You can search for Help topics within Photoshop Elements 9. Key Concepts: When you choose Help→Key Concepts, a Web page opens in your default Web browser and provides many Web pages with definitions of terms and concepts. 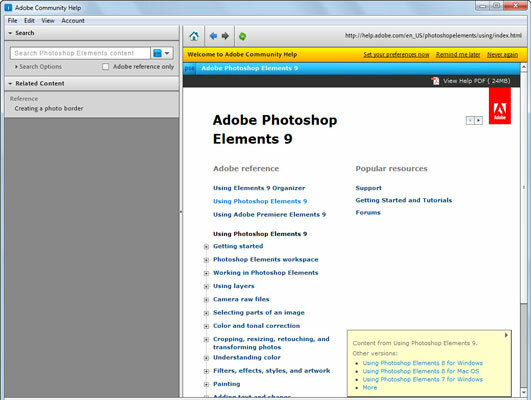 Support: This menu command takes you to the Adobe Web site, where you can find information about Photoshop Elements, problems reported by users, and some work-around methods for getting a job done. You can find additional Web-assisted help information by clicking Photoshop Elements Online and Online Learning Resources. The vast collection of Web pages on Adobe’s Web site offers you assistance, tips and techniques, and solutions to many problems that come with editing images. Be sure to spend some time browsing these Web pages. Video Tutorials: Choose Help→Video Tutorials to open a Web page where videos for common tasks are hosted on Adobe’s Web site. Forum: Choose Help→Forum to explore user comments and questions with answers to many common problems. While you move your cursor around tools and panels, pause a moment before clicking the mouse. A slight delay in your actions produces a ToolTip. Photoshop Elements provides this sort of dynamic help when you pause the cursor before moving to another location.